Intravenous fluids are one of the most frequently implemented interventions that we, as doctors, prescribe. We give maintenance fluids (not so frequently in the ED) and we give resuscitation fluids. 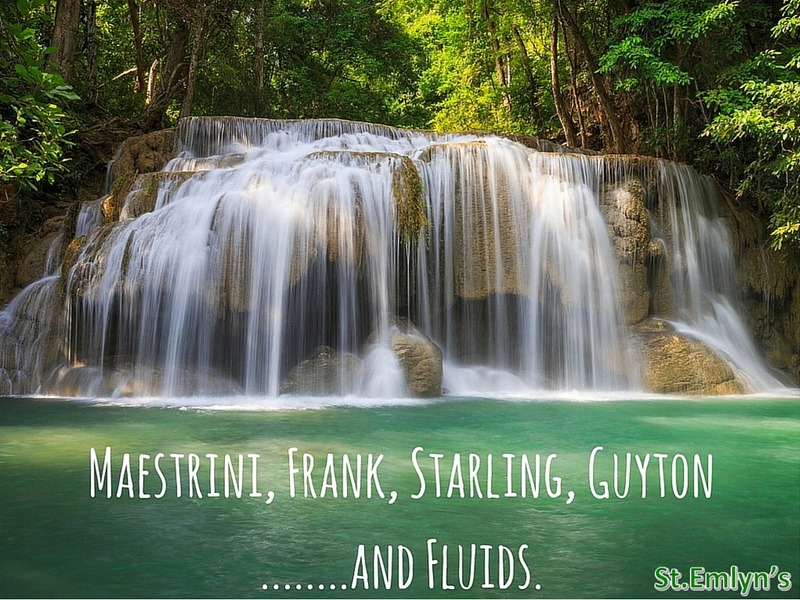 Recently the results of the SPLIT trial were published and the FOAM world came alive with debate and comment on which intravenous fluids we should be using. I want this post to be a recap of the physiology of the effects of administering fluids in the ED. Frequently we prescribe and deliver fluid boluses or fluid challenges to patients either to correct hypotension, tachycardia, reduced urine output and to treat sepsis. It was not until I began my ACCS (Acute Common Care Stem) training that I started to think more critically about why I was giving a fluid bolus and what response I was looking for. I would hate to tar Foundation doctors with same brush, but as a Foundation doctor I think I was learning so much about everything (and still am) that I perhaps didn’t ruminate over this as much as I should have. I’m not going to discuss the nuances of the physiology of different intravenous fluids, but rather the physiological response of the cardiovascular system to fluid. Straightforward, but this is the basis of our resuscitative fluid therapy. We want to improve cardiac output by improving stroke volume. Alas, as usual it is not quite as straight forward as that. First we must understand the work of Maestrini, Frank and Starling. For those who don’t know Dario Maestrini, he was an Italian physiologist who in 1914 began the work that would establish the principles that became more commonly known as Starling’s Law. Otto Frank did similar work in conjunction with Ernest Starling, who in 1918 formally described what we now know as the Frank-Starling or Starling’s Law. As Starling was more famous he received more credit…he probably had more Twitter followers. Irrespective of its origins, the law is incredibly important and useful. The law, put simply, states that if all other factors are constant, an increase in the end-diastolic volume will result in an increased stroke volume. This was a somewhat revolutionary theory, as prior to this it was thought that the heart, and the heart alone, determined cardiac output. Hypertension and aortic stenosis, as examples, cause an increase in afterload. 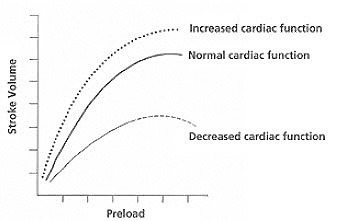 Afterload is also analgous with Ohm’s Law which in cardiovascular is ΔP = Flow x Resistance, where ΔP is the difference in pressure that the heart generates between arteries and veins. So we have preload (venous return) and afterload (resistance). If this formula is reworked we have an equation that allows us to work out flow through a vessel and also a means to calculate resistance. With regards to Ohm’s Law, we can consider the following formula: Cardiac Output = Arterial Pressure/Total Peripheral Resistance. When we administer a fluid bolus, we look to see an increase in preload and a subsequent improvement in stroke volume. The heart becomes the limiting factor in cardiac output when the venous return is a greater volume than the heart can pump. This description of the bathtub analogy comes from a fantastic paper, by Henderson, that explains Guyton’s model much better than I can, can be found here. So that is a, by no means comprehensive, overview of some of the cardiac physiology around fluids, but how do we apply this clinically? Only 4(!) of the studies looked at the effects for 60 minutes or longer. What I find interesting about this, as an EM trainee, is that we do not routinely measure cardiac index or CVP in patients we administer a fluid bolus to. 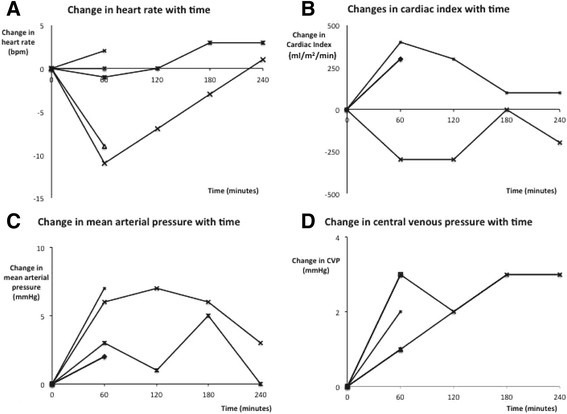 We often look at the BP and HR as a surrogate marker of effectiveness of fluid bolus therapy, and as we can see, the reality is that these studies show no real benefit in reducing heart rate or improving blood pressure. It is worth noting that none of these studies were randomised controlled trials, and as a disclaimer, I haven’t read all 33 papers included in the systematic review! This isn’t quite practice changing evidence, but it does however raise the idea that perhaps we should be performing an RCT looking at the effects of fluid bolus therapy in such patients. So what can we do in the ED to gauge responsiveness to a fluid bolus? The PLR is a fantastic way of assessing fluid responsiveness, however it really does require a measure of cardiac output or stroke volume. As described in a systematic review by Cavallaro et al. PLR whilst monitoring cardiac output is much more sensitive and accurate than by measuring arterial pulse pressure. A simple measure that has been proposed is pleth variability index (PVI), which aims to detect changes in stroke volume by using pulse oximetry waveform amplitude. This sounds great for the ED! Everyone gets a sats probe and boom there we go. However, the majority of studies at present find that PVI is poor predictor of fluid responsiveness. So heart rate, blood pressure, PVI and PLR may not give us any idea of fluid responsiveness in the ED?! PLR seems like the best option but we must measure this effect in real time with some form of stroke volume or cardiac output monitoring. Ultrasound assessment of stroke volume may be an answer, and emergency physicians are certainly becoming more adept with this technique. What we do know is that a positive fluid balance in sepsis is an independent predictor of mortality in sepsis and is an important factor in 28-mortality in patients with AKI. I am declaring myself as somewhat of a Marik-phile, and I recommend reading this paper for a more comprehensive review of fluid responsiveness. We need better studies to determine the most accurate way to assess fluid responsiveness in the emergency department. I am hoping to be involved in such a study in the coming year so watch this space! For more information, check out these awesome links from EMCrit, LITFL and CrashingPatient. The Search for the Holy Grail: Assessment of Fluid Responsiveness. Taming the SRU. Previous: Previous post: A summary of EuSEM 2015 and what you have missed! 4) Would only 1000ml of fluid be expected to impact the above parameters with distributive shock?